Excessive hip flexion in squats exercise could easily lead to lead to knee and low back weakness and injury. You can recognize excessive hip flexion when the shin line crosses the trunk line. 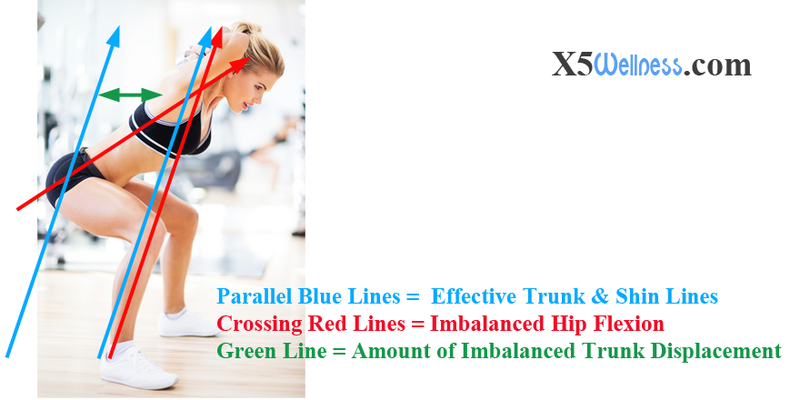 The typical instruction to keep the knees behind the toes without understanding the dynamics of squats contributes to this imbalance. The image above is a prisoner squat. Notice that the knees are kept behind the toes. As you can see in the picture the excessive forward lean, and excessive hip flexion is still apparent. Imaging performing dozens and even hundreds of reps that include variations of squats and lunges with excessive and imbalanced hip flexion. What do you think would happen? Your hip flexors become overactive, stronger and shorter. Stronger, shorter and overactive hip flexors pull your kneecap out of alignment at one end and stress your lumbar spine at the other end. Knee and low back weakness and pain are the natural anatomical consequence of this imbalanced squats exercise.